Greg Orscheln, 74, of Lenexa, KS passed away May 8, 2015. He was born and raised in Kansas City, MO. He attended Christ the King Catholic Grade School and attended Rockhurst High School, where he excelled at both baseball and football before graduating in 1957. He had an offer to play professional baseball for the Philadelphia Phillies, but turned this down to work in the family business. 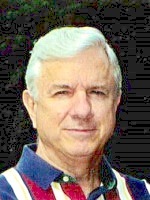 Greg attended Notre Dame University for two years and then graduated from Rockhurst College in 1963. Greg grew up in the trucking business, working for his father’s company, Orscheln Bros. Truck Line before starting his own truck line, Midwest Express Corporation and Greg Orscheln Transportation Company which served the entire U.S. for over 25 years. He sold the business in 2007. Since then, Greg worked as a Management Consultant, Small Business Advocate, Business and Life Coach, Motivator, and was on the Board of the Tonganoxie, KS Chamber of Commerce. Greg’s entire life was dedicated to serving others and spreading an abundance of love to everyone he met. Greg is survived by his wife Susan Orscheln, four sons; Greg Orscheln, Michael (Eileen) Orscheln, Patrick Orscheln and Kevin Orscheln. A visitation will be held at Sacred Heart Catholic Church 5501 Monticello Shawnee, KS from 9:30-11, Wednesday, May 13 followed by a Mass of Christian burial at 11 am. Greg Will be laid to rest at Resurrection Cemetery in Lenexa, KS.